As it has become clear to the non-FT/Economist media, and as it has been clear to economists for a long time, productivity growth is a far more important problem for the UK than the deficit. However I think discussion can get confused if it fails to distinguish between three aspects to the problem. First, the UK is not alone in seeing large falls in productivity growth. Now some of that may be related to the global financial crisis, but not all of it is. As this chart taken from the excellent paper by Richard Jones shows, in the G7 productivity appears to have been declining since at least the 1980s. For simplicity’s sake I will call that the global productivity decline. The second element in the UK’s productivity performance is a structural weakness relative to other countries. I know of no better way of convincing you this exists than this chart, taken from the latest OECD survey of the UK economy. I am fairly sure, however, that what we have seen since the Global Financial crisis is an additional third weakness. Here is the annual growth in UK output per hour. The historic trend, which showed no clear sign of following the global trend and declining after 1980 (a clear UK success), is around 2.25%. Now it is clearly possible to argue that this data shows a decline from this long run trend starting in the mid-2000s based on this aggregate data. If you factor in as well that these aggregate numbers are flattered by unsustainably fast productivity growth in financial services from 2001 to 2006 then you can maybe detect the beginning of a slowdown from the start of the millennium. This would not be surprising, as it would be very hard for the UK to buck the slowdown in global productivity for very long. Having said all that, what happened after the Great Recession is something quite different. But it is wrong to view this period as just one of constant zero growth gloom. Productivity began to recover in 2010 and 2011, to levels that do not look too bad by international standards, but hit negative territory in the following two years. Another, this time more modest, two year recovery was followed by another collapse in 2016. This does not look like just the global productivity decline plus some additional structural weakness. Achieving negative productivity growth two years running indicates a deeper malaise. This is why I think there is a third factor behind this terrible performance. To explain it we need to start thinking about productivity growth as not some kind of manna from heaven, churned out by our universities, or even the product of R&D by firms, but also as something akin to an investment. If you are confident of future growth and profitability, you are more likely to invest in productivity improvements (which may or may not involve physical investment) than if you are unusually uncertain or gloomy. After recessions are over, productivity usually picks up. Firms understand the business cycle, and in UK business cycles over the last 40 odd years recessions are followed by strong growth. So when recessions have levelled out, it makes sense for firms to invest in productivity improvements. That is one reason why productivity growth resumed in 2010 and 2011. The only problem is that something quite unexpected happened. Growth did not return at all. At one stage people were talking about a second UK recession. Firms became both uncertain and gloomy, and productivity growth stopped. That shock, which we can reasonably call austerity, was the first shock that hit the economy after the GFC. By 2013 it looked like the recovery had finally arrived. Productivity growth could resume, but maybe more cautiously than before. And that caution was justified because in the election of 2015 a new uncertainty arose: the possibility of Brexit. Brexit would be one of the most profound shocks to hit the UK for decades: certainly for firms involved in trading or international supply chains and probably wider than that. Just as the costs of waiting are small for a large investment decision when there is serious uncertainty, so Brexit meant that productivity improvements would once again be put on hold. Thus we have three aspects to the UK’s productivity slowdown. The first is the global slowdown, which we managed to avoid for two decades but no longer. The second is a long term structural weakness in developing and applying new technology. The third is the impact of two shocks, austerity and Brexit, which has caused UK firms to put productivity improvements on hold and become very gloomy about the UK’s future. I somehow doubt that we can start doing something about the UK’s long term structural weaknesses while we continue to shoot ourselves in the foot with crazy policies like austerity or Brexit. In a footnote in a recent post, I noted the recent controversy over a BMJ paper relating changes in the English mortality trend to austerity, and in particular cuts in NHS and social care spending. With the journal’s blog headlining the paper as saying “Health and social care spending cuts linked to 120,000 excess deaths in England”, headlines in the press were inevitable. The BBC decided, however, to ignore the study, based (in part?) on advice from the Science Media Centre (SMC). One look at who funds that centre (and putting aside bodies like the Medical Research Council! ), and a conspiracy was born. The vertical axis is the mortality rate (see the paper for the exact definition). 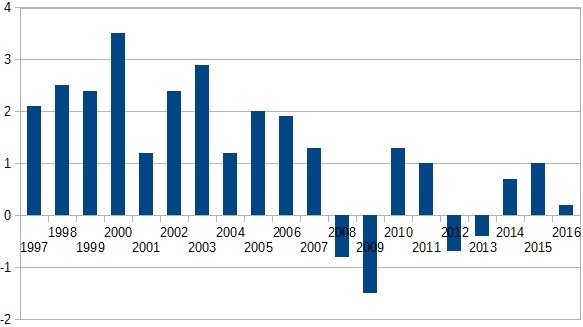 Since 2001 it has been declining over time. The blue line is what extrapolating that trend would imply. However, as the red line shows, since 2012 the mortality rate has flattened off. We could call the difference between the actual and the trend line excess deaths, which are the grey bars. Further analysis by the authors showed that these excess deaths occurred in the over 60 age group. Reductions in hospital and social care spending could explain these excess deaths, with lower social care spending in particular leading to a higher number of deaths in care homes. The figure of 120,000 is the total number of excess deaths between 2010 and 2017 estimated to be due to cuts. As you might say, austerity kills. This description should I hope immediately show the potential fragility of the results. Calculating the number of excess deaths relies on assuming a simple trend decline in mortality which may not be realistic. Even if it is, there are many other possible causes for these excess deaths, and the authors were only able to test for a small number. The number of data points is not large. One obvious way to try and see how speculative this analysis is would be to look at other countries over this period. Has there been a similar levelling off in mortality rates? What follows comes with a huge health warning (forgive the inevitable pun): I am a complete amateaur at handling data of this kind. Because data for the UK is more immediately available to compare to other countries, I will look at the UK rather than England. 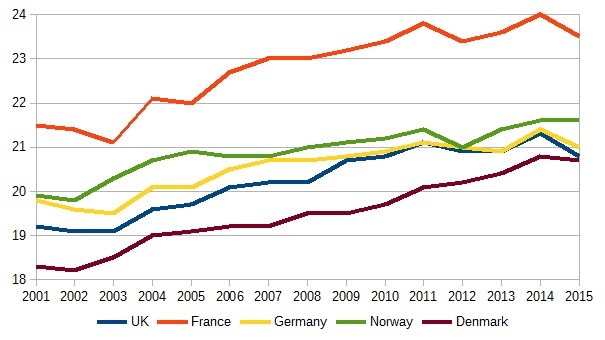 Using data from the World Health Organisation, we can indeed observe mortality (defined simply as deaths divided by population) in the 75+ group actually increasing between 2009 and 2013 in France as well as the UK, but decreasing in Germany and Norway. (The reason for the choice of countries will become clear.) Among the 55-74 age group, there were declines of a similar size in all four countries. Unfortunately we really want to focus on the 65+ group. Another way of looking at this issue is to examine data for life expectancy. The OECD produce this data at age 65. Obviously if mortality rates level off, so does life expectancy. If we look at the UK, we can do something similar (although rather simpler) to the analysis from the BMJ study shown above. 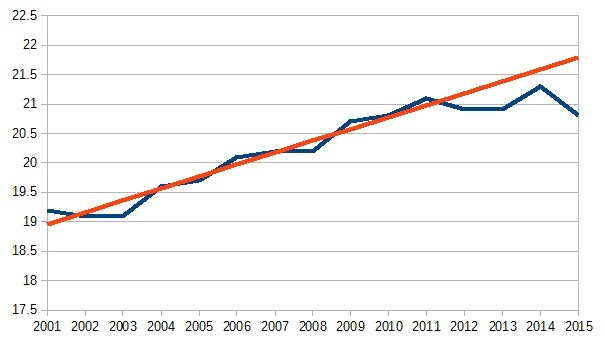 We can see that actual life expectancy at 65 for women (the blue line) was increasing from 2001 until 2011 (the red line is a trend over this period), but has subsequently levelled off, much as the mortality rate does in the BMJ study. A similar pattern occurs for men, although the actual numbers are lower throughout (unfortunately). One thing I did not know until I did this analysis was how much higher French life expectancy is. Yet as you can see from the red line, it too has levelled off since 2011. That could be because expectancy is so high, it could also be because French people also experienced austerity, or because of some other unexplained factor. Austerity in Germany was more modest than in France, and perhaps by coincidence the recent levelling off (the yellow line) is more moderate compared to its previous trend. One country that had no austerity was Norway. As the green line shows any levelling off in the rise in life expectancy since 2011 has been small. The rise in life expectancy in Denmark (where again there was no austerity until 2013) did not change after 2011, but maybe that involves some catching up. I admit it is difficult to visualise trends on a chart with so many lines, so I have done one for another country that has data very similar to Norway and experienced no austerity, which is Sweden. 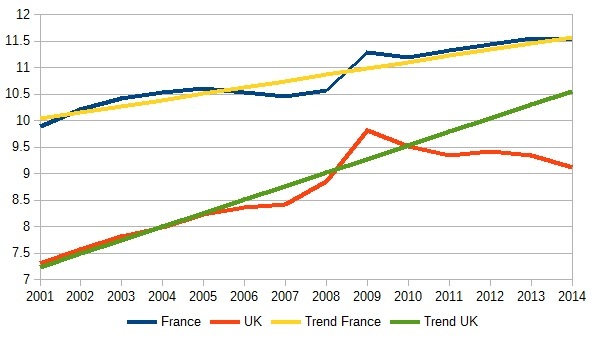 The trend, as with the UK above, is estimated from data beginning in 2001 and ending in 2010. As we can see, actual life expectancy does appear to deviate from trend in a downward direction from 2012 onwards, just as it did in the UK. The difference is that whereas life expectancy is still rising after 2011 in Sweden, in the UK it is flat. 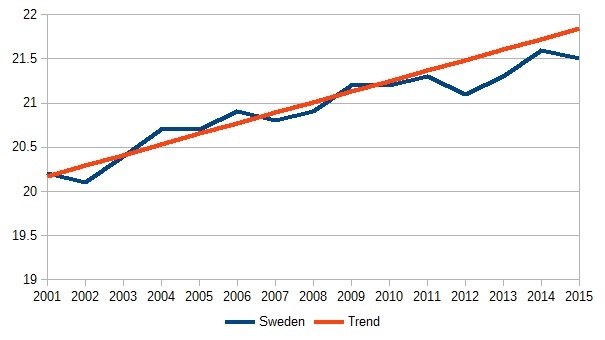 The gap between the trend line and actual in Sweden is just 0.3 years, but in the UK it is almost one year. Thus the two of this group of countries that have experienced a complete levelling off in life expectancy are France and the UK. Is this because both have experienced significant austerity. As far as health expenditures are concerned, the answer is no, as the chart below shows. For comparability I've shown the data relative to a trend for the 2001-10 period. French health expenditure from 2011 has increased at the same trend as 2001 to 2010, whereas UK health expenditure has fallen away substantially. All this suggests that there has been in many neighbouring countries some decline in the rate at which life expectancy has been rising since 2011, but only France and the UK have seen no rise in life expectancy since 2011. French life expectancy was already very high, so perhaps some levelling off was inevitable. Or alternatively there is some missing factor that explains the levelling off in life expectancy in France and the UK. One final statistic, to show that my choice of countries has not been rigged. If we compare life expectancy for women at 65 in 2015 to 2011, among all the OECD countries only one has seen a (slightly) bigger fall than the UK, which is Austria. The only country with the same decline as the UK is France. The real message is that this is an ideal area for some proper research using proper econometrics on a wider sample of countries. I want to end by making a more general point. Linking austerity to health is nothing new. In this post from 2013 I talked about the work of David Stuckler and others. He has a recent paper with coauthors on the health impact of Brexit in the Lancet. As Danny Dorling explains in this excellent verbal account of the UK data in the LRB, there have been a number of studies linking excess deaths to austerity before the one discussed above. You would think that a combination of the data and these studies would prompt the government to at least investigate what is happening, but they have so far done nothing. Perhaps they know what the result of any investigation would be. To see why this is such a sensitive topic for the government, you only need to look at a recent Question Time (9 minutes in) where Aditya Chakrabortty talked about government policy leading to deaths. It is one thing for economists like me to say that austerity has cost each household at least £4,000: this can be dismissed with ‘what do economists know’? But when doctors say the policy has led to premature deaths, that is something else. If I was being cynical, I would say it is no surprise that the BBC did not want to have anything to do with this study. The big story behind the November 2015 Budget is the absence of a big story. If our economy was doing very nicely with no major problems then minor measures here and there would be fine. In reality the opposite is true. In terms of average living standards, our economy is going through its biggest crisis of my lifetime. Forget about lost decades: annual pay in real terms is not expected to reach the pre-crisis peak until 2025. Productivity growth has been minimal since the low point of the recession eight years ago, and living standards have been further depressed by two large depreciations in Sterling. We now have an economy where growth is slowing, just when growth is picking up everywhere else. The relevant question for this budget is what the Chancellor is doing about it. The answer, at least according to the OBR, is almost nothing. We know this because the OBR’s growth forecasts take account of all the Chancellor's measures in this and earlier budgets. So in spite of everything this government has said it has done to boost growth in this budget and beforehand, the OBR expect growth per capita to be less than 1%, compared to a steady average of 2.25% between the 1950s and the financial crisis. All the Chancellor can claim is that growth would be even worse still if he had done nothing, or that the OBR has got it wrong. In truth, though, he is doing almost nothing to boost growth. Rather than expand demand through fiscal expansion, as would be entirely appropriate given that interest rates are at or very near their lower bound and the Bank has been undertaking QE, he is continuing the erratic fiscal contradiction we have seen since 2010. There is a 1% contraction in the cyclically adjusted primary balance pencilled in over the next five years. The most obvious tool that the Chancellor has to boost both demand and supply is public investment. With the cost of borrowing so low, almost every economist would argue we really should be seeing significant amounts spent on infrastructure investment financed by borrowing. After large cuts in 2010 and 2011, in the last few years we have seen public investment as a share of GDP increased marginally in each budget. In 2017/18 it is expected to be 2% of GDP, rising to 2.3% in 2022/23. This is similar to levels before the financial crisis, when the economy was in good health and the cost of government borrowing was much higher. In other words this level of public investment is totally inappropriate given the cost of borrowing and the extent of the macroeconomic nightmare we are living through. What about all these new houses? assuming they will be built. These would be welcome, but the impact over the next few years on house prices will be minimal given the size of the existing stock of houses. I would guess that a fiscal expansion that let interest rates rise significantly would do far more to bring house prices down, and much more quickly. (To see why, read this.) But then what Conservative Chancellor wants a large fall in house prices on his watch. Of course there were some other welcome things in the budget, like more money for the NHS. But it is peanuts, and according to the Medical Director of NHS England it will not prevent already high waiting times rising further. The Chancellor is in effect telling those waiting even longer for operations that he is sorry but it was more important to spend £3 billion preparing for Brexit. What the Chancellor did not do is just as important as what he did do. This year's measures and previous plans continue to move money from the poor to the better off: cuts to tax thresholds and a freeze on fuel duty paid for by maintaining the cuts in work allowances for families that are part of Universal Credit, and freezes on other benefits. Another regressive budget from a Conservative Chancellor. I have not mentioned anything about fiscal targets and fiddles to achieve them because it is these targets that helped get us into this mess and restrain this Chancellor for doing enough to make a difference. With demand, investment, the NHS and elsewhere, we can see how the Treasury view prevents the Chancellor taking action of the magnitude required by the scale of this crisis we face, a crisis made far worse by the stupidity of Brexit. Austerity lost us a decade, and Brexit looks set to make it two, but do not worry: the Chancellor is rearranging the deckchairs. There must be a strong suspicion that even this depressing OBR forecast may be too optimistic. The projections assume that the recent fall in the savings ratio is largely permanent (Chart 3.23). I would be rather surprised if that turns out to be true. If this was part of an attempt to replace stamp duty with higher taxes on housing wealth I would welcome it, but it is not. To anyone who cares to look, the Conservatives are doing terribly at the moment. The most important area is Brexit, of course, where through simple incompetence they may fail to move the negotiations on to their second stage this year. But there are plenty of other disasters that would be getting a lot more coverage in the absence of Brexit, such as the Universal Credit rollout. Some are already suggesting that Labour have hit some kind of limit to their support, as a result (of course) of Jeremy Corbyn’s leadership. The way I like to think about this came originally from a paper written in 1967 by the sociologist Frank Parkin, who was trying to explain the ‘paradox’ of working class Conservatives. The dominant culture, he argues, is small c conservative, and so any radical politician like Corbyn is automatically at a disadvantage. This dominant culture, of which the media is a key part, can be challenged by institutions like trade unions, but it also loses much of its hold in a General Elections, where politicians are given unprecedented access to voters, and equally important voters are unusually attentive. I have stressed the importance of the media in many contexts (such as mediamacro), I argued this is what was happening as the polls started to move before the result, and again after the result. The extent of the Labour surge was not inevitable, as their leadership understood. To explain the extent of the Labour surge, you need to bring in other factors that Steve Richards and others have talked about, none of which were inevitable. Anthony Wells of YouGov directly addresses the question posed in the title of this post here. He points out that many voters are just unaware of issues like Patel’s resignation, and so may not see the full extent of the government’s self-inflicted problems. He also reports a YouGov poll that asks Tory voter why they support the Conservatives. Around half said they supported their aims, even though they were struggling to deliver them. 22% said that they were competent, even though they didn’t agree with all their aims. 19% said that they didn’t agree with their aims and that they were not governing well, but that they were better than Corbyn’s Labour. Is that 19% high or low? No comparative figures from earlier times are offered. Is it surprising, given the treatment of Corbyn by the right wing press? Does that mean that Corbyn is a barrier for Tories switching? - it may, or it may not. Does it mean that Labour have hit some kind of plateau of support? Of course not: the 19% may still be persuaded, and the 22% that somehow think this government is competent are low hanging fruit. But what about Brexit. As Jolyon Maugham reminded me, public support for the government’s handling of Brexit has plummeted. Why isn’t Labour picking up support as a result of this? YouGov asks a regular question about particular issues, and which political party would handle them best. After the election 34% said the Conservatives would handle Brexit best, but that had fallen to 26% by October. Yet the equivalent percentages for Labour were 20% and 18%. In other words the government’s bad Brexit performance is hurting the Conservatives, but not benefiting Labour. If you look at the parties that have benefited from the fall in those thinking the Conservative party are best at delivering Brexit, they are UKIP (why haven’t we left yet), the LibDems (Leave regretters), and most of all None/Don’t Know (haven’t a clue). This does seem to point to a weakness in Labour’s approach. The line to take, given Labour’s Brexit strategy, is the one that Corbyn has used: the government’s internal divisions and the Brexit hardliners are destroying the chance of a successful negotiation with the EU. But that message is not getting across. I personally do not see why Corbyn should be a problem in that respect. But with more fallout over Brexit very likely in the near future, this looks like an opportunity Labour are missing. To be fair, Steve Richards does touch on this in talking about how commentators, and many Labour MPs, underestimated Corbyn’s ability to campaign in a General Election. Here is just one example. How many saw the results of this medical study reported on BBC news? It took me less than a hour to read the study. The basis for the analysis can be questioned, as the authors acknowledge, but given the political controversy around similar claims on Question Time the decision not to cover the report looks very odd. To hide behind the assessment of an outside body that itself has been the subject of controversy (see here and here) seems very naive. The idea of the state stepping in during a recession to offer some group of the unemployed a job was selectively adopted by the UK Labour government in 2009: see here by Paul Gregg. Richard Layard has proposed it for the long term unemployed. We can think of both schemes as providing a partial insurance policy against the failure of countercyclical stabilisation policy to completely do its job in a downturn/recession. But MMT (Modern Monetary Theory) economists go beyond that to suggest that it could be a permanent feature, which would eliminate involuntary unemployment (IU) without creating inflation. Given our recent experience, the use of a Job Guarantee as an insurance policy for all unemployed people during a recession seems like a good idea. Unwanted leisure is replaced by labour producing useful output, and paying a wage greater than unemployment benefits would add to automatic stabilisers. The devil is of course in the detail: JG jobs need to be setup to allow job search (many jobs are created even in a recession) or (if necessary) retraining and the JG jobs would need to involve an output that was socially useful . The main problem that Gregg discusses in his paper is the ‘Lock-in’ effect, where those in a JG job reduce their search activity. To combat that and for other reasons it also seems helpful to provide detailed individual advice along the lines of the Swedish scheme described here. MMT economists have suggested extending such a scheme so that it operates at all times. As I understand it any worker without a job would be offered a JG job. It can be refused with no consequences in terms of unemployment benefit, so it that sense it is not workfare. Many people who were confident of getting another job quickly might want to focus all their spare time on job search, and so might decline a JG job. Anyone who wanted a job could receive one, so the scheme would largely eliminate involuntary unemployment (IU). In the rest of this post I’m going to focus on this idea of JG as being a permanent feature of an economy, rather than just something put in place during an economic downturn. A key issue is what the JG wage would be. In most MMT literature I have seen, the JG wage would be the minimum wage or better: see Mitchell here for example. There seems to be an obvious consequence of this. Unfortunately many private and public sector jobs are paid the minimum wage. These jobs are risky whereas JG jobs are by definition permanent. Minimum wage non-JG jobs may have compensating advantages like a career structure, but still it would seem probable that the existence of JG jobs paying the minimum wage would attract some workers from private sector minimum wage jobs. The obvious response would be for private and public sector employers paying minimum wages to increase their pay sufficiently to stop this happening, which in turn would often lead private sector firms to raise prices. How far this ripples through the economy is not certain , but it is quite possible that the overall price level rises by a noticeable amount. This higher aggregate price level would reduce the real value of the JG wage. If this reduced wage differentials in the economy as a whole this process might be regarded by some as beneficial, but it is an implication that JG advocates need to acknowledge. Suppose we start with an economy with stable inflation, implying unemployment was at the NAIRU, and introduce JG.. As this puts upward pressure on inflation because the costs of losing a job are reduced. the only way of keeping inflation stable is to deflate demand, which of course would reduce output, labour demand and therefore increase the number of people on JG jobs. So if we were to compare two economies where inflation was stable, one with IU and one with JG, the number of JG jobs would exceed IU in the other economy. That does not mean that output would necessarily be lower in the JG economy, because JG workers are producing some kind of socially useful output while the IU workers are not. In welfare terms you have also eliminated any non-pecuniary costs associated with spells of unemployment, and the distribution of income in the JG economy is more equal than in the IU economy. However in practice the productivity of JG workers will be pretty low, as they need to be allowed time for intensive job search and the turnover in JG jobs is likely to be high. We have a trade-off, and if anyone can point me to any analysis of this particular trade-off I would be very grateful. Can I end with a personal plea. When I write things like this it is often assumed by MMTers that I am being critical for the sake of it. In other words they think all I want to do is attack the JG or MMT. I don’t. I have far better things to do with my time. I actually find the idea of JG appealing at an intuitive level. More generally I agree with MMT on many things, although not all. But I am also fed up with policy makers implementing bad policies just because they sound good to those policy makers, so I want to subject any policy I intuitively like to rigorous analysis. JG jobs could be as assistants in police stations, schools and other public sector institutions. Or they could be jobs in social enterprises. Keynes defined involuntary unemployment as those seeking a job at the going real wage. As JG jobs would be at the minimum wage it would not eliminate all involuntary unemployment defined in this way: as I noted those looking for a higher than minimum wage job who chose to stay unemployed would still technically be classed as involuntarily unemployed. But this is being a little pedantic. Mosler and Silipo (section 7) talk about the JG wage as a nominal anchor. This captures the idea that movements in the JG wage would influence other wages. However nominal anchors, like the money supply or the exchange rate, are often talked about as being able to control the aggregate price level in the longer term on their own. The JG wage would not be able to do this. As the authors note, active stabilisation policy would still be required to do this, although the number of JG jobs could be a useful indicator of what action was required, just as the unemployment rate is now. Another way of saying the same thing is that the JG does not supplant the need for active macroeconomic stabilisation. What we are seeing in the UK right now is quite incredible. The referendum vote itself was quite something: people voting to make themselves poorer than they might otherwise be for some ill-defined notion of control or because of myths about immigration. But what has happened subsequently is even more extraordinary. With a referendum vote so close, it would have been both natural and statesmanlike for the government to go with the majority in the most unifying way possible. The obvious way forward would have been to arrange a open-ended transition where we were out of the EU but still in the Customs Union and Single Market, leaving the government to see what it might be possible to negotiate as an alternative. In other words the policy the Labour party are currently suggesting. From the polls that seems to be what the majority of people want. Little would change for business, so this way forward from the vote would have caused only minor immediate economic damage. Instead of this, it seems that the leaders of the Leave campaign have not just won that vote, but have effectively taken over the government, dictating not just the government's preferred terms and timetable of leaving but also taking away large chunks of power from parliament at the same time, Henry VIII style. A few brave Conservative MPs plea for parliament to be given just a minimal say in some of the most profound changes in the UK in decades, and their faces are put on the front page of the main ‘serious’ right wing newspaper under the headline ‘mutineers’. How can this be happening in a country known for its pragmatism? It seems more like the revolution that happened 100 years ago, where the revolution’s leaders declare any doubt or deviation from the path they decide as treachery. Any suggestion that it might be to our advantage to conduct negotiations to Leave in a slightly different way is declared as nothing more than a plot to overturn the Revolution. At one stage business leaders had to pretend Brexit was going to be wonderful before they were allowed to talk to ministers. Anyone who dares to point out bits of reality that might get in the way of the one true path is a saboteur that really wants to overturn the will of the people. This is a regime in a democracy that seems at times more like a dictatorship. How can this be happening? How can so few wield so much power? Why does the Prime Minister, who was a Remainer, now dance to the tune of the revolution's leaders? A referendum in which 52% of voters chose just to leave the EU, nothing more, cannot confer this kind of power. Even the right wing press are not that powerful on their own. The answer I think lies in a group of perhaps little more than 100,000 people, two thirds men and around half of whom are over 65. They are the membership of the Conservative party. These members are far more anti-European than the party’s MPs or its current Prime Minister. The threat the Brexiters have, which Remain MPs fear and which has governed so many of the Prime Minister’s actions, is that they will force a leadership election. In any election a Brexiter is almost certain to be on the ballot that goes to party members, and given that electorate (and the influence the Tory press have on them) a Brexiter will almost certainly win. They will then go for a clean break from the EU, or what is commonly known as No Deal. What else could explain a Prime Minister putting forward legislation involving a fixed date to leave that might make her own life more difficult, just because it was suggested (one might guess) by the editor of a right wing tabloid at his birthday party? Why else does she tolerate almost open insubordination by her foreign secretary that would in any other situation have led to him losing his job. Why is she so concerned about keeping her Brexiter ministers happy and as a result ignores the rest of her MPs and by now the majority of the country? She has focused all her energy on preventing a rebellion from her right and as a result has completely neglected the discussions with the EU. Although the influence of Conservative party members is talked about a bit, I still find the contrast with Labour just a year or two ago extraordinary. Then all that political commentators could talk about was the malign influence that half a million Labour party members were having on the opposition party. Yet here we have a much smaller group of Conservative party members effectively holding the government, parliament, the Prime Minister and therefore the country hostage, during the most important period of UK politics in a generation. Will our political commentariat that are not part of this revolution please wake up. Jonn Elledge had a nice piece in the New Statesman about free trade. The question he poses is how Brexiteers can exalt free trade but want to leave the most developed free trade area in the world, the EU. The answer he gives is to distinguish between ‘free to’ and ‘free from’. When economists talk about free trade they mean free to trade, which is what the EU has achieved through regulatory harmonisation in particular. Brexiteers mean ‘free from’ in the sense of trade free from government intervention. I think we can go beyond what Elledge says and make exactly the same point about the term ‘free market’. A Brexiteer might think of a free market as a market free from government interference, including government regulations. An economist would be more likely to talk about a free market as one where people were free to trade in a socially optimal way. The state might be required to make that happen in many ways. To take just one example, markets can sometimes not exist because of information asymmetries, but if those asymmetries are removed then people can beneficially trade. (Economists will immediately recognise this as Akerlof’s famous market for lemons.) Removing those asymmetries does not necessarily require government, but government could play that role. If it did, we would have a free market as an economist would define it, but only as a result of what some on the right might call government ‘interference’. As Mariana Mazzucato would argue, the state can also create markets through organising research and development. Two governments that harmonise each others regulations can create better markets in both countries by increasing competition. Equally there are other government measures that make markets work better. The most obvious example is to reduce monopoly power, which reduces prices and increases the quantity traded in that market. In truth the idea of a market completely free from government is semi-mythical: all markets work within a legal framework created and enforced by the state. When some people complain about government interference in markets, and eulogise ‘free markets’, they are really just complaining about forms of interference they do not like and are using the notion of freedom to glorify their distaste. So those like Osborne who wanted a smaller state so taxes could be lower (and perhaps for other reasons to) went for austerity as a means of achieving that. Those, like most Brexiteers, who wanted less regulation (including no state interference in how they personally avoid paying tax) pushed Brexit, even though it involved reducing the ability to trade. What Colin Crouch calls corporate neoliberals turned a blind eye to growing monopoly and rent extraction. While all three groups were happy to eulogise free trade and free markets, conflicts arise over the interpretation of free. For the Brexteers free trade means freedom from government interference, while for Osborne it meant free to trade. For corporate neoliberals free markets means markets that are free from government limits on monopoly and attempts to avoid rent seeking, while ordoliberals want the state to control monopoly so markets are free to work for society. Today for most people most of the time the idea of freedom generates positive emotions (although that itself is a social phenomenon, as Adam Curtis among others explored.) It is therefore a word worth expropriating for a political cause if you can. But by noting that conflicts arise between ‘free to’ and ‘free from’ we can perhaps see that all politicians are doing is trying to promote a form of freedom that suits their cause. In an interesting piece, Will Davies argues against the need to want to define political or social terms precisely as if they “connect cleanly and unambiguously to some object”. The hapless progress of the Brexit negotiations continues. I do not mean the almost childish nonsense of May’s new wheeze. Instead I’m talking about the Irish border. It seems, if you read most of the UK press, that out of the blue this new obstacle has been sprung on the UK at the last minute. Some of the press talk about surprise, while the Guardian talks about it ‘emerging’. Some have even decided to cover up their ignorance by inventing conspiracy theories. With political commentary in the UK largely reflecting the beliefs of the UK side, then this also means that this surprise extends to our negotiating team. In reality there is nothing to be surprised about. The Irish border was one of the three issues to be dealt with in the first stage. As the UK government has consistently said they are leaving the Customs Union and Single Market (CU/SM), and have failed to convince even themselves that they can invent a new magically invisible border that can police countries that have different customs and regulatory regimes, it was only natural that an EU paper would suggest that Northern Ireland stay in the CU/SM to avoid a hard land border. So why did the UK, and its media, seem to forget about this third issue, when even I had flagged it up as the critical issue a couple of months ago. What I think happened is that the Brexit side convinced itself that, because a hard border would only arise as a result of different trade regimes, then the border was really a trade issue and so should be in stage 2. In other words the EU had simply made a mistake in putting it in Stage 1, and would therefore quietly forget about it. That reasoning was part wishful thinking and part delusion. Wishful thinking because, as I wrote back in September, it is a problem with no obvious solution that Brexiteers would accept. And delusion because the UK side continues to imagine that the EU is governed by Franco/German interests, and why would these countries be concerned about what happens in Ireland. What it completely failed to understand, and what the EU had understood, was the importance of the border issue to the people on both sides of it. It was an important reason why Northern Ireland voted to Remain. But I wonder if there is something deeper behind the UK attitude. For too many people in England, the ‘troubles’ in Ireland were a quarrel in a strange country between people of whom we know little, to paraphrase Neville Chamberlain. As a result, there is little comprehension of why a hard border should be such a big deal. You would think memories of bombs going off in England’s cities would change that, but I’m not sure it did, anymore than more recent terrorism has led to a better understanding among English people of tensions within Islam. In contrast, most people in Northern Ireland would move heaven and earth not to go back to those times. Even while all this might be true, it is no excuse for the same attitudes to be held by our political leaders. John Major knew better than this, as did Tony Blair. Only the arrogant disdain for different realities displayed by Brexiteers can explain a mistake of the magnitude of ignoring the border issue. I suspect any politician that lied the way the Brexiteers lie, or lived in the alternative reality they appear to live in, would not have survived long in UK politics two decades ago, whereas now it has become a criteria for holding high office. At the end of the day there is little difference between Brexiteers who tell people that new trade deals with countries outside the EU can make up for trade lost with the EU, and Republicans who say scrapping Obamacare will extend coverage and their tax bill reduces taxes for most people. In both countries when the ability to gain office is determined by how well you can fire up or charm a base, because a large part of the media will then assure you have a good chance of winning elections, is it any wonder the political system fails to select for competence, understanding or respect for wisdom and knowledge. There is a simple solution to the problem of the border. It is for the UK side to commit to only negotiate new trade arrangements that would be consistent with a soft border. That would mean staying in the Customs Union and parts of the Single Market, but it could leave open the possibility of negotiating over the remaining parts of the Single market and perhaps free movement. Anyone who tells you that this concession by the UK side does not respect the referendum result is once again lying: Leave won precisely because they ruled no arrangement out. Any red lines erected after the referendum carry as much weight as the Prime Minister currently has authority. Already we have many people in the UK saying why should we adapt our policies to keep the people of Ireland happy. This is the Chamberlain type attitude that I talked about earlier. The Irish border is at least as much our creation and our concern as it is of anyone else. Maintaining peace within the UK should be any government’s top priority. The fact that it has failed to make it onto Brexiteers to do list tells you as much about their outlook and competence as you need to know. Whether the UK will be forced to take this position I do not know. I stand by what I wrote recently that there will almost certainly be a deal, one element of which will be a transition where we stay in the EU/SM. Indeed I understated my case there. First, there can be no such thing as no deal. As Davis has explained, there are things that have to be sorted to keep planes flying and the like. He has described this as “some sort of basic deal without the bits we really want”. What that remark shows is that the ‘no deal is better than a bad deal’ line is simply a bluff and he knows it. The bad deal is no deal. And finally there is parliament. I know it has been pathetic until now, but that does not mean it would sign off on the worst possible kind of Brexit. But what the border issue will most likely show is that it is unlikely we will get to a deal involving transition without cabinet resignations.